Yesterday was this year’s Big Day of Giving. Begun in 2013, it’s a program of the Sacramento Region Community Foundation, to grow philanthropy through a 24-hour online giving challenge that highlights the year-round work of the region’s nonprofit community. Last year, donors gave almost 39,500 donations, worth $7.2 million. Yesterday, givers donated nearly $7.4 million in unrestricted funds to their personally favorite causes. Yes, it’s about raising money, but it’s also about making connections between individuals and helping their dreams improve the world. For example, the Sacramento Philharmonic Orchestra in Northern California provided a “Link Up” program where thousands of public-school students performed with the professional orchestra, in a variety of pop-up concerts around town. While the concerts raised funds for classical arts in the region, they also inspired students to devote their lives to performing music for others. The range of causes grows annually. For example, this year’s donors could support the Carmichael Parks Foundation with a gourmet dinner in the park; feed the entire Front Street for a year; provide money for textbooks at Folsom Lake College; help animals, keepers, volunteers and staff at the Sacramento Zoo; ensure lifelong learning at Friends of the Library in Winters; and offer career support for girls through the work of the Sacramento Branch of Soroptimists International. 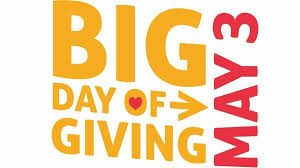 Bigdayofgiving.org houses year-round giving as well as the one-day giving event. Check out special Days of Giving where you are, to see how you can make a difference where you live!